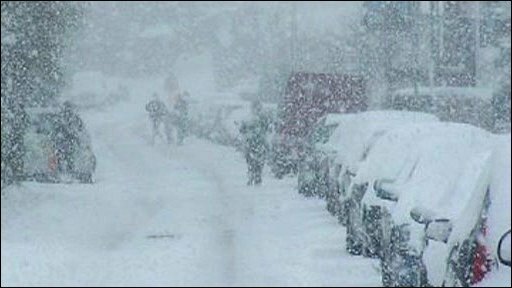 Fresh snow has been caused major disruption for motorists, with roads near the Dover coastline being most affected. The A258 and A256 were both blocked by snow earlier on Saturday with residents in the Deal and Sandwich area virtually cut off from the rest of the county. Kent Police said the A258 from Dover to Deal had now been reopened but the A256 was almost impassable. The Army have been called in to help the emergency services in Kent. A spokesman for the Ministry of Defence (MoD) said the Argyll and Sutherland Highlanders regiment based in Canterbury had supplied soldiers and vehicles to help firefighters. He also said the 36 Engineer Regiment in Maidstone had been using its Land Rovers to deliver meals to the elderly and vulnerable. More snow is expected to fall across the county later. The Met Office has warned of a "high risk of severe weather" and up to 10cm (4in) of snow to fall locally in Kent and East and West Sussex on Saturday. Forecasters said strong winds could also cause drifting in many parts. Sam Maidment, who lives in Deal, had to abandon her car during her journey home from work on Saturday morning. She said: "I left work at six o'clock this morning and tried to get home from Dover docks to Deal. "I was behind a snow plough which couldn't get through. As fast as the snow plough had cleared it the wind was whipping the snow up and back on to the road." Ms Maidment added: "I decided to turn round after about an hour and head to Martin Mill where I have an auntie and uncle. I drove down Station Road into Martin Mill and got stuck in a snow drift. My car is still stuck there." 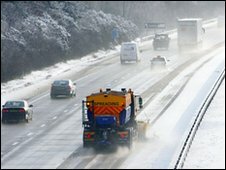 Kent Police has urged motorists to only travel if their journey is absolutely necessary. Assistant Chief Constable Gary Beautridge said: "We thank the majority of motorists in Kent for driving responsibly in the difficult conditions but would like to remind people that driving styles need to be adapted. "This means leaving more distance between you and the car in front as it could take you up to twice as long to stop if you have to brake suddenly. "Ease off the acceleration when taking corners and roundabouts and avoid braking suddenly."